This educational video offers insights about how sensory processing disorders, the underlying cause of many behavioral problems, make it difficult for children to function at home and school. Parents and professionals will learn to recognize signs of sensory disorders and to use strategies for coping with them. Drs. 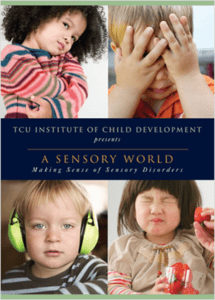 Karyn Purvis and David Cross discuss their work and research at TCU, and Carol Kranowitz demonstrates playful activities to help children improve their self-esteem and overcome everyday struggles that hamper their success.